Work done in the Jones lab is focused on several topics related to origin and maintenance of plant biodiversity across scales that range from genes to landscapes. An emerging theme in the below projects are threats to plant biodiversity due to climate change and habitat loss (fragmentation). Most projects employ a variety of field, lab, and synthetic analytical approaches from population genetics, population biology, molecular ecology, landscape genetics, and community ecology. Several projects are underway in tropical and temperate ecosystems. Intraspecific variation in drought responses of tropical trees – implications for species distribution under climatic change. Tropical forests harbor the majority of the Earth’s terrestrial biological diversity and provide humans with valuable products and ecosystem services. Rainfall is generally high in tropical forests, but at the same time, most tropical forests experience one or two dry seasons per year. 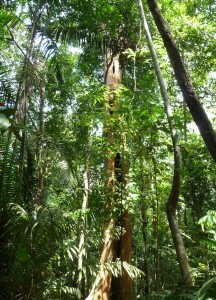 As a result of climate change, pronounced shifts in dry season length and intensity are predicted for tropical forests. During dry periods tropical trees and their seedlings generally have lower growth and survival, but species vary in how strongly they are impacted by drought. From temperate forests, we know that drought responses vary not only among tree species, but also within species, with populations growing at different sites showing different responses. Such differences within species may be due to genetic factors after long-term evolutionary adaptation to different sites, or it can be due to short-term plasticity in responses to environmental factors. How strongly populations within tree species vary in their drought responses, and to what extent that variation is influenced by genetic or environmental factors, will play a large role in determining how species will respond to climate change. However, to date we know virtually nothing about differences in drought responses within and among populations of tropical tree species. The aim of this research project therefore is to assess how much drought responses vary within tropical tree species, how strongly that variation is determined by genetic or environmental factors, and what plant traits drive differences in drought responses. The research will take place across a strong rainfall gradient in Panama, and will combine field experiments measuring growth and survival of transplanted seedlings in different forests with physiological measurements and genetic analyses. 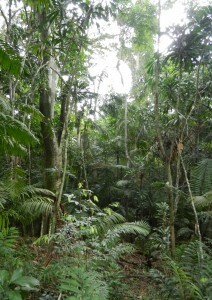 The project will improve predictions of how tropical forests will respond to global climate change. Specifically, the information generated by the project will be useful for predicting shifts in the distribution of tree species (including commercially important timber species), for designing management and conservation strategies to preserve tropical forest diversity and ecosystem function, and for designing carbon offset programs that seek to mitigate effects of climate change through reforestation and forest preservation. This NSF funded project (DEB 1257976) is in collaboration with Drs. Liza Comita (Yale) and Bettina Engelbrecht (U. Bayreuth), Jones lab postdoc Ivi Ceron, and Comita lab postdoc Eric Manzane. Opportunities for students are available in the field and lab, including bioinformatics projects. Contact Andy for more information. Habitat loss and fragmentation have been implicated as primary drivers of pollination declines, but these observations contradict most model predictions indicating that pollinator networks should be resilient. Recent theoretical models predict that if ‘keystone’ species are lost, pollination webs may be more vulnerable, resulting in sudden network collapse. However, lack of experimental studies examining the consequences of plant or pollinator extinction means that we know little about whether such collapses occur in nature. In previous work this group has shown that the movement of hummingbird pollinators is strongly restricted by landscape fragmentation. 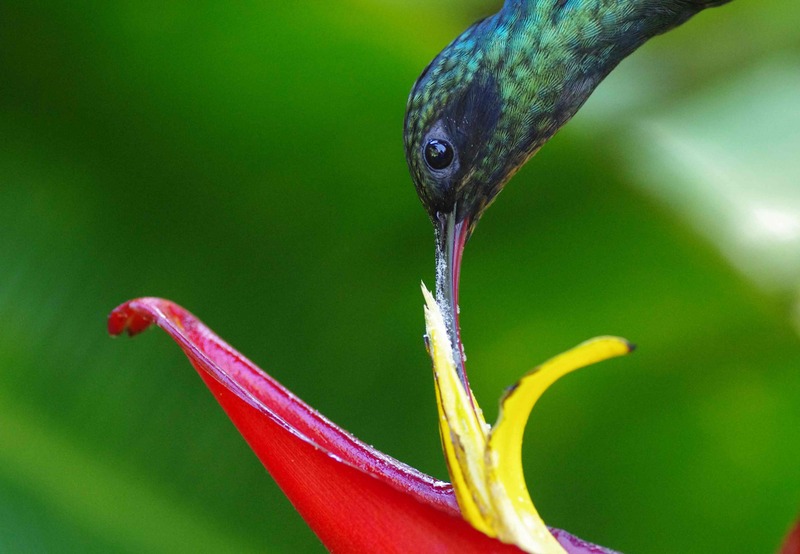 This results in pollen limitation and subsequent regeneration failure in a common keystone forest herb (Heliconia tortuosa) — a phenomenon known as “extinction debt”. This sets the stage for the first manipulative experiment to test the interactive effects of keystone resource loss, fragmentation and pollinator movement on pollination network structure. This research will address two overarching questions: (1) What are the consequences of keystone plant decline and extinction to the broader pollination network? (2) Can pollinator movement and landscape connectivity buffer pollination networks against network collapse? Under the network collapse hypothesis, reduced H. tortuosa densities will limit nectar resource availability thereby decreasing pollinator visitation to fragments and resulting in eventual network collapse. In this instance, landscape connectivity will decrease the minimum number Heliconia required to maintain network structure. Under the robust network hypothesis, the behavioral plasticity of pollinators will confer resistance to the network, even if some plant and hub pollinators are missing or at low abundance. To address these hypotheses the research team will experimentally remove H. tortuosa in isolated and connected forest fragments (N=20) to determine whether altered densities of this species affects (a) hummingbird movement, (b) plant reproduction and genetic diversity, and (c) the structure of the pollination network. Hummingbird movement will be quantified for all species in the network using Radio-Frequency Identification Devices (RFID). This method will enable observations of the entire hummingbird pollinator community at an unprecedented temporal resolution (seconds) and spatial scale. By integrating theory from landscape ecology, behavioral ecology and pollination biology, this research effort has the potential to transform current thought on the stability of pollination networks in the context of environmental stress. Results will also contribute knowledge about the degree to which connectivity can mediate the effect of species loss on pollination networks. This project is funded by NSF (DEB 1457837) and is in collaboration with PI Matt Betts (OSU FES), and coPIs Adam Hadley (OSU FES), and John Kress (Smithsonian NMNH). Dynamical interactions between plant and oomycete biodiversity in a temperate forest. Understanding the mechanisms that maintain plant biodiversity in forests and other natural ecosystems is a fundamental challenge in ecology. 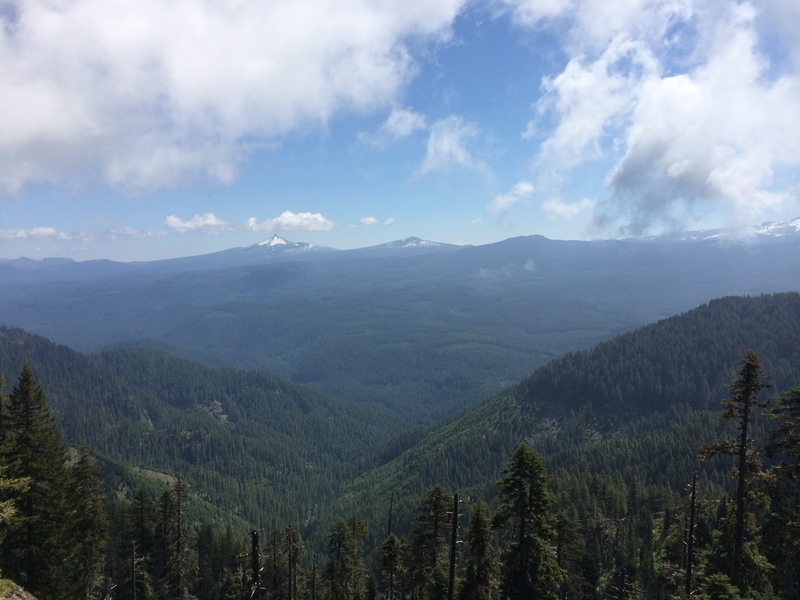 This project is examining the role of native oomycete plant pathogens in maintaining tree species diversity in an old growth forest in the Pacific Northwest. While the impact of invasive pathogens and pests on ecosystems can be dramatic, the function of native pathogens and pests are less well understood. For example, do pathogens and pests promote biodiversity by limiting the most dominant species? Alternatively, do species achieve dominance through the evolution of resistance or tolerance to endemic pathogens? Microbial pathogens, including oomycetes, have evolved to infect a large number of plant host species. However, the mechanisms of oomycete adaptation to different host plants is largely unknown. This project will focus on the role of native oomycete pathogens in maintaining tree diversity in an old growth forest in the Pacific Northwest, the Wind River research forest in southern Washington state. Oomycetes, or water molds, are highly destructive plant pathogens, best known for causing the Irish potato famine in the 1850’s. Though well known as agricultural pathogens, oomycetes are diverse organisms that are native to and abundant in many forest ecosystems. However, less is known about the ecological roles that oomycete pathogens play in these ecosystems. This project will examine three dimensions of oomycete and plant interactions: (i) document the oomycete species present in the Wind River forest, (ii) determine the functional ability of each oomycete species to infect or limit the growth and survival of abundant and rare plant species in the forest, and (iii) use genetics and genomics to determine how oomycetes adapt to different plant hosts. A particular focus will be on the role of endemic broad host range oomycetes, and how their interactions with dominant and less abundant host plants may differ. By integrating the three dimensions of diversity, a better understanding will be developed of the roles of oomycetes and other pathogens in this and other natural ecosystems. This understanding will improve management of natural ecosystems and the diseases that occur within them. The project is funded by an NSF Dimensions of Biodiversity grant (DEB 1542681) and is in collaboration with PI Brett Tyler (OSU CGRB), and coPIs Nik Grunwald (USDA ), David Oline (Southern Oregon University), Margaret Metz (Lewis & Clark), and Jim Lutz (Utah State University). 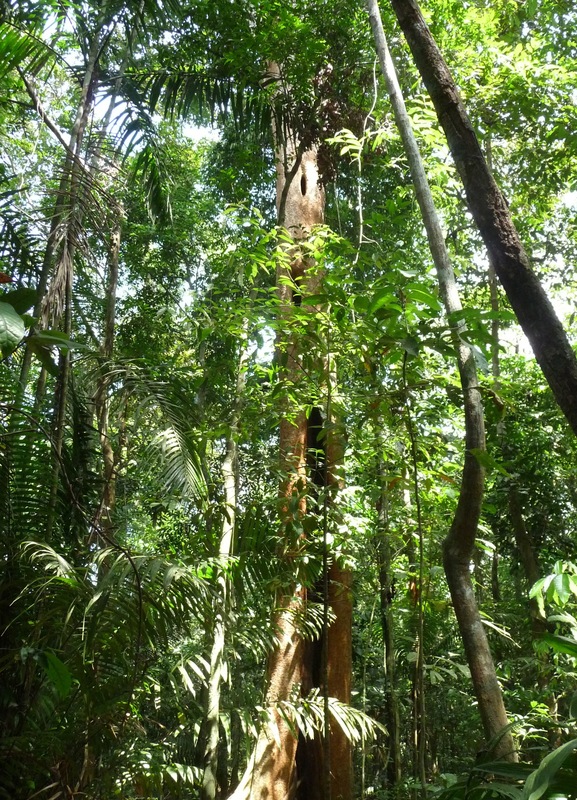 This research project will explore how tree regeneration responds to climate anomalies associated with an El Niño event for eight tropical forests. The 2015-16 El Niño event is among the three strongest El Niño events since 1950. Strong El Niño events bring climate anomalies worldwide, including increased temperatures, reduced cloud cover, decreased rainfall, and drought over a large portion of the Tropics. The eight study forests occur along a steep rainfall gradient from the wet Caribbean to the dry Pacific coasts of Panama. The project capitalizes on previously mapped populations of seedlings and trees in each forest. The 2015-16 El Niño event brought reduced cloud cover and increased light availability to all eight forests during the 2015 rainy season, favoring seedlings and trees. The 2015-16 dry season began about one month earlier than normal, promising severe drought. The project will test several hypotheses, including the extent to which tree species from wet and dry forests across the gradient may respond in different ways to reduced rainfall expected during El Nino in 2016. 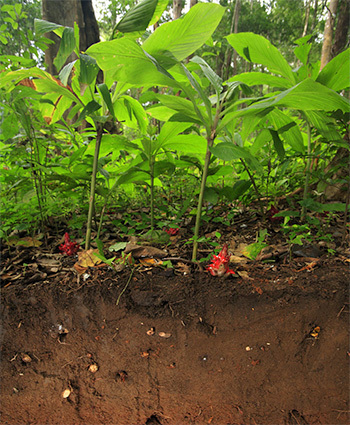 Low light levels limit the metabolism and root development of seedlings in the deeply shaded understory of tropical forests, making understory seedlings particularly vulnerable to climate variation. The net effect drought and increased light on seedling performance (recruitment, growth and survival) and tree survival will determine which species regenerate successfully, potentially altering forest species composition. This project is important because tropical forests play a vital role in global carbon and water cycles and are the most biologically diverse ecosystem on the planet. A deeper understanding of the range of responses observed among plant species will provide insight into future forest responses to anthropogenic change including changing rainfall regimes and rising atmospheric carbon dioxide concentrations and temperatures. 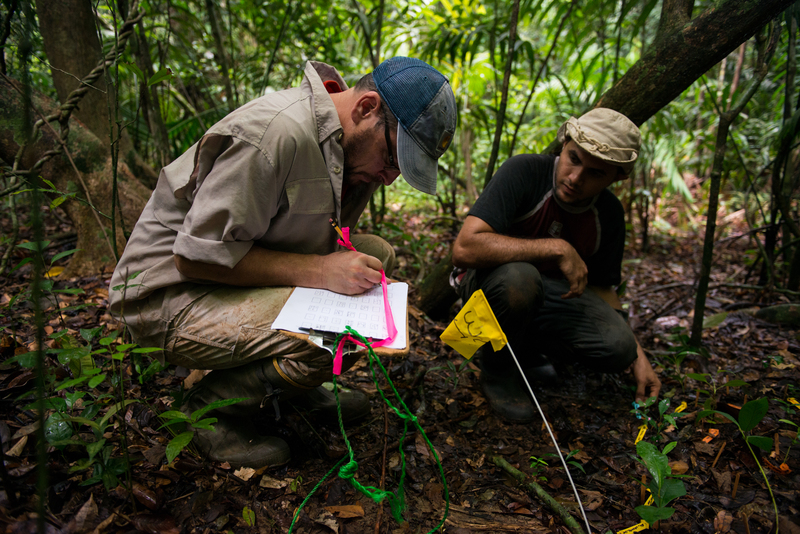 The researchers will survey an existing network of tropical tree seedling plots within eight forests that a span a pronounced rainfall gradient in central in Panama during the 2016 El Niño event. Censuses of seedlings will measure their recruitment, growth and survival across two seedling size classes and (1) determine which forest sites and tree species are most affected by an extreme El Niño event, (2) examine the relative roles of reduced soil water availability and increased light on seedling performance, (3) evaluate the predictive value of functional traits for seedling responses to the event, (4) measure the size distribution of El Niño related seedling mortality and (5) provide a baseline for modeling the effects of extreme El Niño events on tropical forests through assessing minimum soil and leaf water potentials and their variation across forests and species. The project is among the most comprehensive studies of the effects of an El Niño event on tropical forest regeneration to date and will provide insight into variation of responses within and among species, seedling size classes, and forests. The research will improve projections for the consequences of global climate change for these forests, as well as for vegetation-climate feedbacks, which will be important for forest management under current and future climate conditions. This is funded by an NSF RAPID award (DEB 1623775). The project is in collaboration with Drs. Liza Comita (Yale University), Bettina Engelbrecht (University of Bayreuth), Joe Wright (STRI), and Owen Lewis (University of Oxford). This NSF Dimensions of Biodiversity grant will fund two international workshops to understand how the phylogenetic, functional, and genetic dimensions of diversity are changing in forests, how these changes are related to environmental drivers, and how they affect forest function, dynamics and resilience. Standardized data from 51 large-scale forest plots in Asia and the Americas on forest structure, tree species composition, and dynamics, in combination with data on tree species functional traits, phylogenety, and genetics, presents a tremendous opportunity to advance these objectives through coordinated collaborative analyses and syntheses. This will be accomplished through a combination of international workshops involving scientists from partner plots in the US and China, scientific exchange fellowships, and the development of accessible analytical tools. 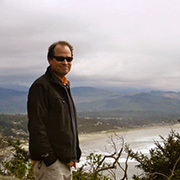 The proposed activities build directly on the model of a successful NSF-funded IRCN, and take advantage of expanded datasets on forest dynamics, species-level functional traits, and phylogenies, as well as new datasets on seed production and seedling regeneration, soil microbial diversity, and tree genetics. Analyses and syntheses of these datasets will integrate: (i) tree functional diversity with species performance to better understand how functional traits control species’ performance among environments; (ii) tree functional and phylogenetic diversity to investigate controls on forest ecosystem function; (iii) tree phylogenetic and functional diversity to predict community responses to change from species’ performance across environments; (iv) metagenomic surveys of microbial diversity with tree functional and phylogenetic diversity to assess below-ground controls on forest diversity and function; and (v) genetic, functional and phylogenetic diversity to understand the consequences of genetic diversity for species performance. These combined activities will transform current understanding of how forests work, and how they are changing in response to anthropogenic change. This project (DEB 1545761) is in collaboration with PI Stuart Davies (STRI), and CoPIs Liza Comita (Yale), Nate Swenson (Maryland), and Helene Muller-Landau (STRI). Genetic identification and mapping of Cedrela species in Peru. In collaboration with Rich Cronn (USFS), we are investigating landscape genetics of the economically valuable, but threatened genus Cedrela across the Peruvian Amazon with the goal of developing DNA forensic tools for species identification and tracking. Ph.D. student Kristen Finch is testing some of the ideas that are proposed for this proposal in Douglas Fir in the Pacific Northwest. This project is funded by the USFS international programs. The role of pollinator movement and landscape structure on population genetic diversity and connectivity of Western columbine across Andrews’s meadow communities. In collaboration with Matt Betts (OSU FES), we looking at how hummingbird movement within and among different alpine meadows in the HJ Andrew’s forest is influenced by landscape structure and how, in turn, this influences pollen mediated gene flow and genetic connectivity in Western columbine (Aquliegia formosa). We are currently using genotype by sequencing and whole genome sequencing approaches to examine gene flow and signals of local adapation in this common alpine meadow plant. This project is funded by the Andrews LTER Faculty Research Strategic Investment. 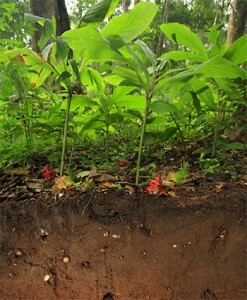 Patterns and mechanisms of below ground interaction in a tropical forest. This project seeks to develop a comprehensive understanding the role of abiotic and biotic processes structuring below ground plant communities and the implications this has for the maintenance of biological diversity and ecosystem function.